The Listening Orchard is a continuation of research into Digital-Nature Hybrids that follows on from the Meditation Egg and Rhubaphone. The work uses a values-led approach to explore the impact of the Critical Philosophy of Technology on both design process and artefacts designed to support connection to the natural world. The work draws on Heidegger, Borgmann and Feenberg to establish principles for design. When I first started to work with the Gardens Team at Clumber Park gardeners and volunteers took me for walks around the garden. These walks had a huge impact because each showed me a new, personal aspect of the garden. Everyone had their own insights and stories that gave me a very rich experience of the garden. I remember one volunteer telling me about the wildlife in the garden and others telling me about the histories hidden in the garden. I felt privileged to have been given these glimpses that revealed different layers of the garden. This was one of the seeds from which the Audio Apples grew. The Walled Kitchen Garden at Clumber Park is the home to the Regional Apple Collection for the garden’s five neighbouring counties. The collections preserve heritage varieties, and also provide a key to social and cultural history of the area. For example, one apple variety is named after a pit pony called Ulland which alludes to the importance of mining in the area. The garden and former house were built using money from the mining industry and presence of mining in the area is even evident in the structure of the garden walls, which are sectioned to limit damage in the event of subsidence. The apples hold many stories of the garden and locality. This was another seed for the project. 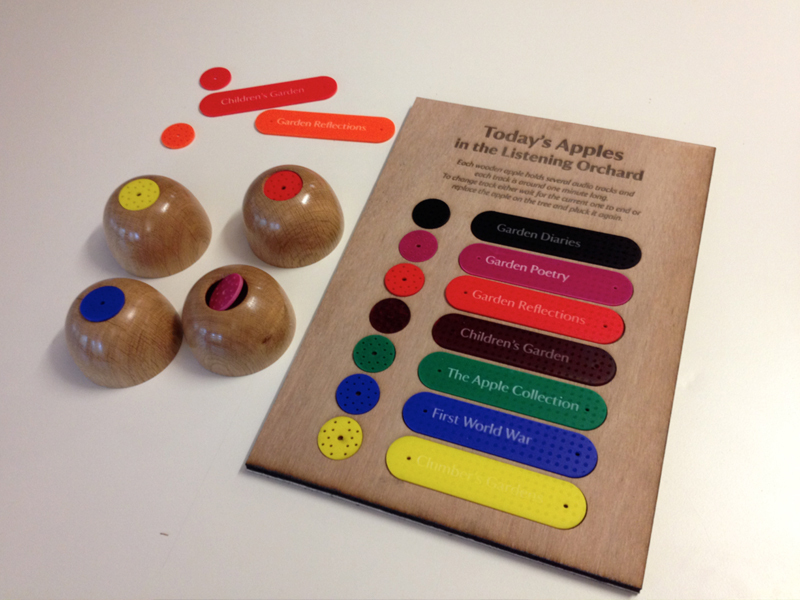 The aim of the Audio Apples is to share stories of the Walled Kitchen Garden and the Apple Collection, told by people from the garden. 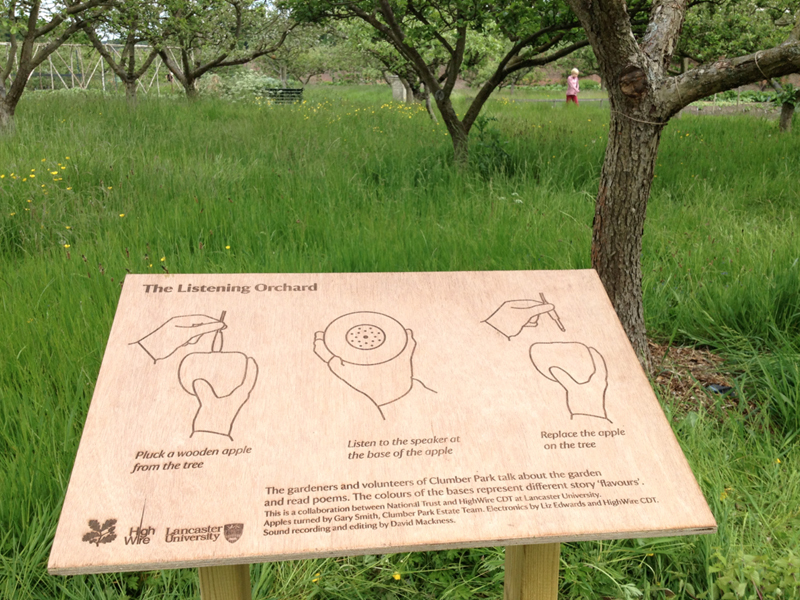 The trees in orchards provide semi-enclosed story-telling spaces, where people can pause, listen and reflect. Wooden Audio Apples hang from the trees. When the wooden apple is plucked from the audio jack from which it hangs the audio track begins. 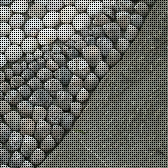 The design allows audio content to be changed through the year reflecting changes in the seasons and developments in the garden. The aim is to grow a varied repository of stories to add to current collection of poems, stories, diaries and garden information. 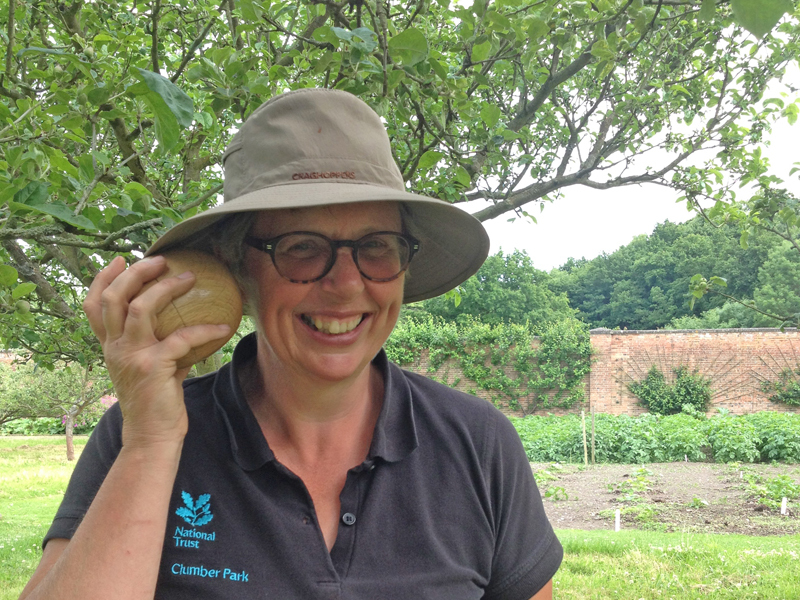 Writer and HighWire colleague Claire Dean, is currently creating stories that bring together myths and fairytales with landmarks in the Walled Kitchen Garden. Andy Darby, another member of the HighWire team, is editing the children’s stories and narrating the recordings. Over the summer we will be gathering stories from the Regional Apple Collection, ready for Apple Weekend in the Autumn. 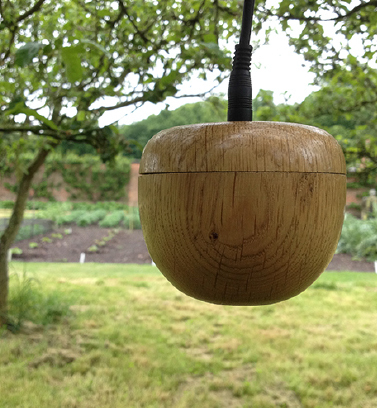 The wooden Audio Apples have been turned by Gary Smith, a member of the Clumber Estate Team, from oak sourced from the park. It is important to us that the Audio Apples are materially and creatively rooted in their home. Many others from Clumber Park and Lancaster University have been involved in various aspects of making the apples and recording stories. Instrumental to the recording process is Dave Mackness, a Sound Recordist and Editor who came to work on the project through an internship supported by the HighWire programme.